An essential part of the modern corporate world, the Staff Handbook should define the goalposts for the company/employee relationship, communicating company policies, rules and systems in a clear and concise way so that everyone knows where they stand and understands the framework for issue resolution. So, you've been tasked with producing or updating the Staff Handbook. Where to start? Assembling the material, making decisions on content, chasing colleagues to provide their bit. What starts as an apparently straightforward process can easily degenerate into a Catch-22 situation. And, that's before you address the actual presentation. With sections arriving from different parts of the organisation, written by various people, the task of putting it all together in a well-ordered format can be daunting. 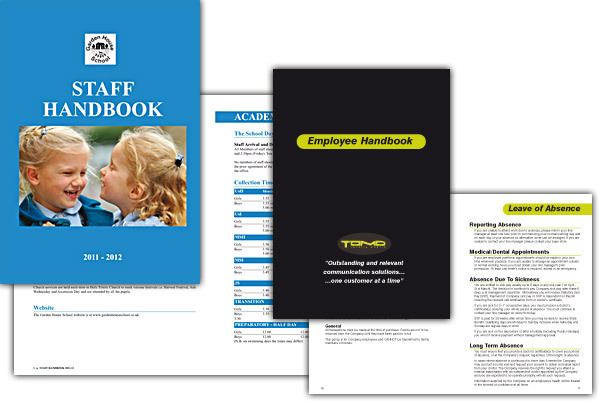 The Staff Handbook needs to be well written, with the information presented in a clear and consistent manner. That's where we can help. The majority of material will be produced in Word or similar. Everyone has their own ways of writing and formatting documents so one of the biggest challenges is wrestling the text, headings, sections and so on into an homogeneous format so the final handbook benefits from a consistent style throughout. Modest rewriting can make a tremendous difference to the presentation but a clean design and good typography will be the saviours, transforming what can, potentially, be a rather turgid document into a nicely designed but, above all, well formatted and laid-out piece that is far more likely to actually be read. In practice, we often receive a bunch of assorted Word docs and spreadsheets. First task is to clean the docs and arrange the material in a logical and consistent way: random headings, bullets and varying paragraph spacing are the norm. Only then can we knock it into a clean, east-to-digest format with lovely typography and clear thinking.